Our Industrial-grade Steam Cleaning equipment is ruggedly durable and highly effective. Hotsy and Landa steam cleaning equipment are the brands chosen more often by industrial users because of their dependability. Pressure washers are often referred to as steam cleaners, and ours are the best in industry…engineered for everyday use and built to last. All models are engineered for safety, and are equipped with the best warranties in the industry. 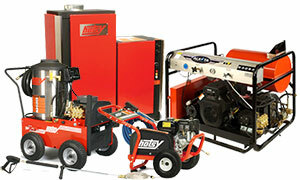 Available in both hot water and cold water models, Hotsy and Landa pressure washers / steam cleaners are available in a number of styles for indoor or outdoor use, and can be mounted on one of our trailers for mobile cleaning, or installed as a stationary unit for onsite cleaning in a facility or wash bay.